We have available a big store of original spare parts for tannery machines of any brand. 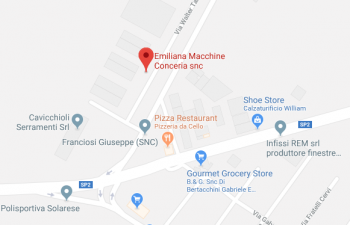 Well furnished is our department dedicated to spare parts for tannery machines out production as RIZZI, FLAMAR, CM, MERCIER, TURNER, RM, POLVARA, LO STAMPO, INCOMA, CARTIGLIANO, BERGI, MOSCONI, ALETTI, MOSTARDINI, GOZZINI, etc. ; we are direct suppliers of tannery industries and also of many mechanical and trading company operating in the tannery department. We are also able to furnish special spare parts, modified as per customer's request; rapid is our delivery service guaranteeing times reduced of stopped machine during the rebuild. All it takes is contacting the people employed in our stock specifying the brand and the model of the machine that requires the maintenance, as well as the name or the particular nr of the spare part that need to be replaced. For any problem don't hesitate to contact us, we have highly qualified technicians for shaving machines, fleshing machines, splitting machines, presses, sammying and setting out and all the machineries for tannery. In our stock we have a large range of accessories and consumables. complete gear box two speeds , wooden pins, washings, stainless steel doors, electric boxes, extractors, aerial chains, rubber conveyor belts for extraction shaving and splitted leather, vacuum air systems , spare parts for vacuum dryer, stainless steel meshes, vacuum pump, water pumps, electric components, safety system pneumatic or intrinsic Birker, electronic component, plc, inverter, pedals and original spare parts for RIZZI, FLAMAR, ITM, CM, MERCIER, ALETTI.